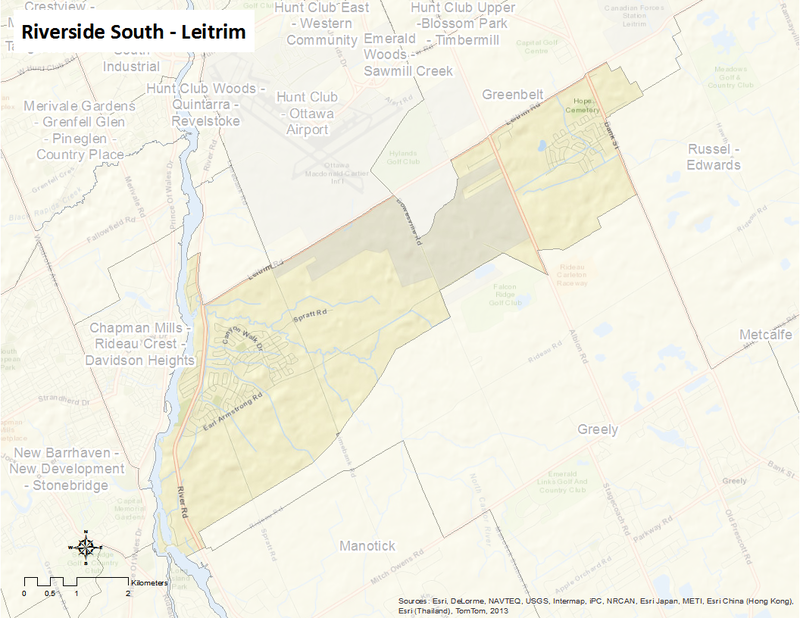 Riverside South-Leitrim is bounded by Leitrim Road to the north and Rideau Road to the south. Bank Street describes the eastern boundary, and the Rideau River forms the western boundary. This is a suburban neighbourhood located in the former City of Gloucester just southwest of Ottawa Macdonald-Cartier International Airport. The neighbourhood includes the communities of Leitrim, The Landing, River’s Bend, The Villas, Summerhill Village, Honey Gables, Rocky Harbour, and Canyon Walk. In the early 1990s this area was primarily farmland. However, over the last decade there has been an extensive housing development that appears to be growing in the pace of other major communities such as Barrhaven, Kanata and Orleans; it is planned that Riverside South will become a major community with expansions to the south closer to Manotick and to the east closer to Leitrim/Findlay Creek, another growing community. A proposed North-South light-rail transit line was expected to serve the community by 2009 but this was cancelled in 2006. However, most rural routes will be upgraded and widened to cope with increasing traffic; widening and improvement of Limebank Road – “the worst road in the city” – was completed in 2010. The Vimy Bridge was built over the Rideau River to link Riverside South with communities in Barrhaven even without the light-rail extension. This bridge connects a major suburban community with a population that will likely exceed (the total of the two areas) 100,000 residents. Riverside South is also the only community to have a test school with a balanced school year. L’école élémentaire catholique Bernard-Grandmaître enjoys three fewer weeks of summer vacation, while giving their students and staff a full week off at Thanksgiving, Victoria Day, as well as an additional week over March Break. This pilot project is helping to decide if other schools in the Ottawa area will adopt this type of balanced school year.